One day in late June, my daughter and I were driving home & I took a shortcut through a nearby neighborhood. It was then I spotted 2 windows leaned up against someone's trash. 1. My daughter was with me & I know the whole thing would have mortified her & perhaps scarred her for life & then I'd have to hear about it my whole life how I scarred her for life. 2. I know people in the neighborhood & honestly I was kind of embarrassed to be caught picking trash. The next morning, my daughter & I were the only ones awake as she was getting ready for school. I remarked to her that I had forgotten to tell her Dad about the windows last night. (I was hoping he'd go get them for me.) I knew it was too late at this point & I gave them up for lost. That afternoon, coming home from work, I was pulling into our driveway, when I spotted the craziest thing leaning up against our garage...it was the windows! I couldn't believe it! I ran into the house & asked my husband how he knew I wanted those windows! He said he vaguely heard me (in his sleep!) commenting to Olivia about windows in the trash. I never mentioned the location of the windows! He drove around the nearby neighborhoods until he found windows & figured those were the ones. He rescued them before the garbarge truck had come! I guess it was just meant to be that I have these windows. So stay tuned, my friends, because this is not the end of this little pretty! This is going to be good! Love old windows and chicken wire! What a great find and sweet of your dh for picking them up. Can't wait to see what you do with them. I LOVE that window! What a sweet and attentive hubby to listen and respond that way. Thanks for the kind words, my friend. I AM remaining positive. I feel too well to do otherwise! Wooohooo! I really do love that window, and I love what you did with the wire. The best part of the story is that your husband loves you enough to go on a window hunt. Love your windows and love your DH for doing that for you. That is a sweet story! That will make the transformation even more special. Awesome hubby and awesome windows.....can't wait to see the finished product!!! I love chicken wire. I can't wait to see them finished. I love the chicken wire in the window frame. I can't wait to see what else you use. Perfect! Okay, so Gina, I am now going to follow your lead. I picked up a few windows myself about a month ago...they are leaning up against a wall in my basement....waiting. Fantastic!! Can't wait to see the rest. What a loving husband!! How very thoughtful - and attentive - of your husband to find those windows for you. 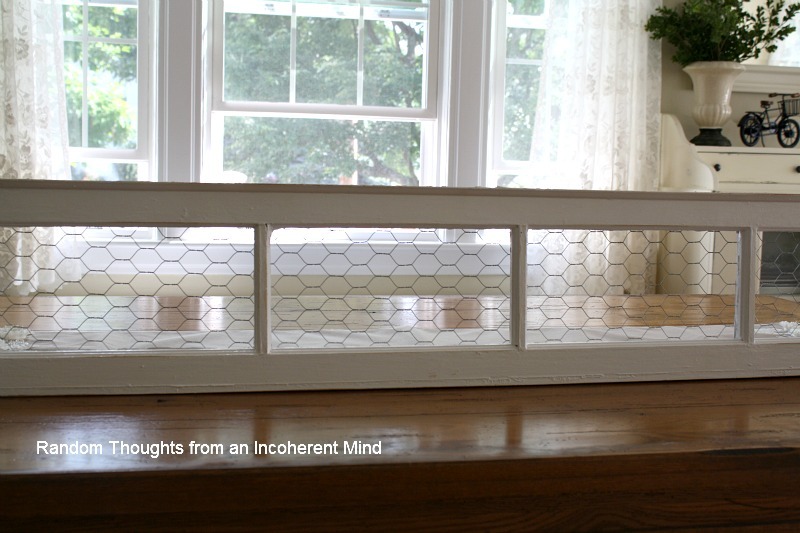 I liked the glass in them, but I like the chicken wire, too. That was so sweet of your husband and so funny you then wanted the glass taken out! Really love the chicken wire and will look forward to seeing what else you do with it! That is one SUPER HUBBY. He gets loads of points for that one :))) It's awesome G. Totally awesome. Lucky lady that was so sweet of him to search for your window. I like the chicken wire better. Oh great!!! 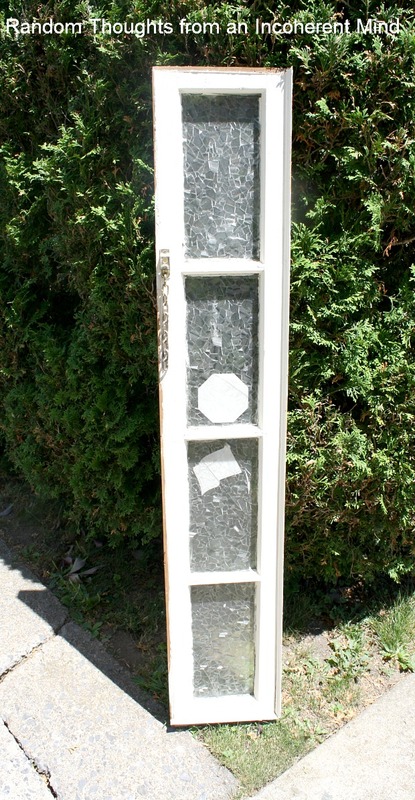 I love playing with old windows ~ there are so many possibilities. I love the chicken wire. You have a sweetheart of a husband, Gina! Mine does the same...we are blessed! Awesome Gina! I can't believe that your hubby drove around looking for them. He's a keeper! Hey girl, I think it was meant to be. I'm afraid I would have had to have scarred my daughter and grabbed them the first time. Glad they were still there. Can't wait to see what your genius mind is creating. What a guy...love the chicken wire. The size of these windows is great. Love the tall, skinny look! Gina, how awesome! You see! Our husbands really listen to us! LOL Even when we don't think they do!What a great story and beautiful windows. I agree! They were meant to be yours! Can't wait to see what you do! How cool Gina! !~ Great find there my friend. Not sure if you got the last memo Newbie pick was going up today. Sorry for the confusion, and no big deal anyhow, when it gets up it gets up:) Thank you dear. Ooo I see great possibilities there! And bless your husband's heart! Oh my goodness Gina, what a great story...but what's even more great is your hubby going out and looking for them. How sweet is that? What a lucky gal you are...He is definitely a keeper...Hee, Hee, Hee. The window looks great. Can't wait to see the other one.